Deputy Attorney General Rod Rosenstein speaks at a news conference in October at the Justice Department. To the many mysteries swirling around the investigation of Russian election interference and the dismissal of FBI Director James Comey, add this one: Why is Deputy Attorney General Rod Rosenstein continuing to supervise the investigation? 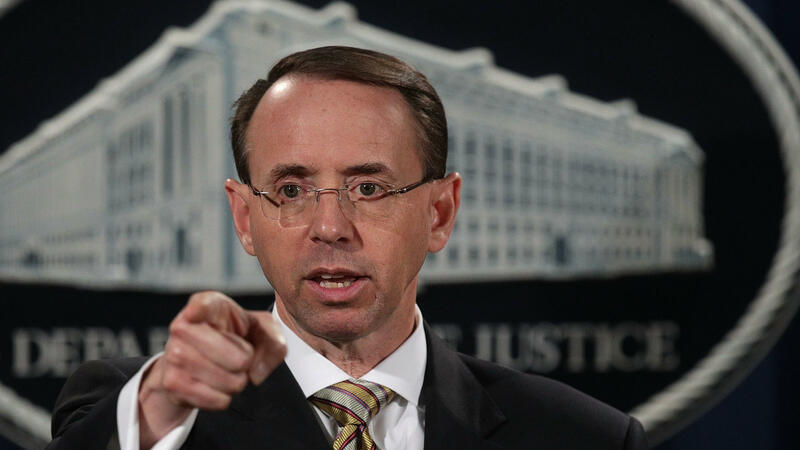 Rosenstein is the Justice Department official who pulled the trigger and named special counsel Robert Mueller to lead the probe in May, only days after President Trump fired Comey under questionable circumstances. But Rosenstein also wrote a memo advocating the dismissal of Comey. The deputy attorney general testified he was put off by Comey's public remarks about the criminal investigation of Democratic presidential candidate Hillary Clinton's email practices. "I wrote it. I believe it. I stand by it," Rosenstein told Congress of his memo criticizing Comey. The president went on to tell a television interviewer that he had actually dismissed the FBI director over "the Russia thing," leading Comey and others to suggest he had been fired in a possible attempt to obstruct justice. Mueller's investigators are gathering information about the matter. ABC News reported Sunday that the special counsel had demanded documents from current and former DOJ officials about Comey's ouster, including internal communications. And earlier this year, The Wall Street Journal reported that Mueller's investigators had interviewed Rosenstein in June or July about the FBI director's removal. That is all leading some people in and outside the Justice Department to ask how Rosenstein can oversee an investigation in which he is a witness to the central events. "As the deputy attorney general has said numerous times, if there comes a point when he needs to recuse, he will," DOJ spokeswoman Sarah Isgur Flores said in an email. "However, nothing has changed." Legal ethics experts said they are puzzling over the issue. Stephen Gillers at New York University School of Law said he believes Rosenstein can continue to supervise the special counsel so long as he is under no personal legal risk. "The fact that Rosenstein wrote a memo summarizing the reasons to fire Comey does not mean he is a 'person of interest' in the investigation," Gillers said. "He could have done that in good faith in response to the president's instructions. If ... the president or White House officials were planning to use the memo to disguise an obstructionist purpose — in which case Rosenstein would be a chump but not himself guilty of anything — then Rosenstein can supervise Mueller. They have the same interest." Kathleen Clark, an ethics expert at Washington University Law School in St. Louis, said she has a theory about why Rosenstein may not have had to recuse himself — yet. Clark pointed to federal regulations governing Justice Department special counsels. Those investigators are required to file reports with DOJ brass when they take certain steps, such as executing search warrants or interviewing significant witnesses. And, Clark said, it's possible that has not yet happened with respect to their inquiry into Comey's dismissal, leaving Rosenstein in the clear for now. Former federal prosecutors who represent both political parties told NPR that they don't understand Rosenstein's reasoning. And, they said, the lack of transparency adds to the problems at the Justice Department this year. But Clark said Rosenstein may be taking a "prudent" course for now. "Just think in the last 18 months how much trouble has been caused by the Justice Department, or the FBI, talking about criminal investigations," Clark said, referring to the former FBI director's statements about Clinton's email practices before the election last year.